For those old enough to remember, the Corvette (GM’s premier sports car) had turned into a flashy two-seater by the mid 1970s. The 1978 film Corvette Summer epitomized how flamboyant the Corvette had become. The Corvette by this time looked more comfortable parked in front of a trendy discotheque rather than a drag strip. Who could blame Chevrolet? After 1971 most performance cars had the life sucked out of them and by the mid 1970s what performance cars were left were shadows of their former selves. Chevrolet would not entirely abandon performance; it just was not the centerpiece of the Corvette’s essence during most of the 1970s. Chevrolet let the potent big-block Corvette die at the end of the 1974 model year. Though this low compression 454 CID V8 was not the beast of a few years prior it still had plenty of horsepower and torque (270 horsepower, 380 lbs/ft of torque) to keep most performance car fans happy. In 1975 horsepower continued to drop, the top engine – a 350 CID V8 was rated at only 205 horsepower. And the other 350 CID V8 available on the 1975 Corvette was a meager 165 horsepower. Part of the reason for the drop in horsepower this year was due to stricter emissions controls such as the new federally mandated catalytic converter which stripped away power better than impeachment. Power would again receive a slight uptick in the late-1970s when the L82 (350) V8 would reach as high as 225 horsepower. But during this time it was the W72 400 CID V8 powered Pontiac Trans Am that was the fastest built new American car not the Corvette. Adding insult to injury, the Trans Am also during this time, when equipped with its optional WS6 handling package, easily out handled the Corvette on the test track. By 1982 when the C3 Corvette was entering into its fifteen year of production (with essentially the same basic body style), the Corvette was in serious need of a major update. This is not to say the 1982 was a bad car, in fact it still was a very stylish car and like Lauren Hutton it had aged very well. 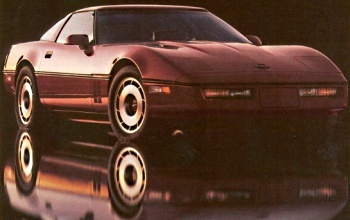 By 1982 rumors had circulated to most Corvette fans that an all new 4th generation (C4) Corvette was soon to be released. Little bits and pieces of information were leaked by the auto press. What most fans didn’t know was that the Corvette was to embark in a new direction – the performance and handling malaise of the previous decade would soon end. Finally Chevrolet was going to get serious and start battling the new array of European high-performance two-seater sports cars. This seemed a pretty tall order especially when for 1982 horsepower was at 200 for the Corvette’s top motor (which happened to also be the only Corvette motor) and only an automatic transmission was available. Still 1982 was better than 1981 when the best engine under the Corvette’s hood was a 190 horsepower 350 V8. 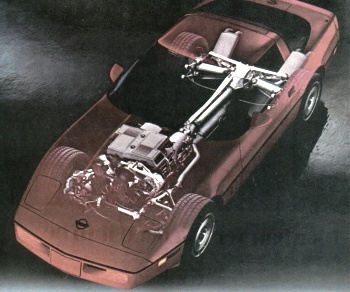 Corvette fans were worried that this new Corvette might see a horsepower drop for 1983. It was a valid concern given the situation in 1982 where even “performance” V8s were anemic by muscle car era standards. For instance the 1982 Camaro Z28 and Pontiac Trans Am packed a punch of 165 horsepower with their best motor for 1982 (they both shared a 5.0 liter Cross-Fire fuel injected V8). The 1982 Mustang GT was in the same neighborhood with a 157 horsepower 5.0 liter HO V8 as its top motor. As if the anticipation of Corvette fans worried about the all new C4 Corvette for 1983 was not enough, the wait was further delayed by Chevrolet. Instead of fans seeing the new Corvette in Fall of 1982, its release was delayed until March of 1983. Chevrolet in its infinite wisdom decided to scrap the 1983 production year and make the new Corvette a 1984 model. Hence there was never a 1983 Corvette sold to the general public. The National Corvette Museum has what Chevrolet has confirmed as the only 1983 Corvette still in existence; however this car was never available for sale to the general public. When the 1984 Corvette was released in March 1983, it was given a hero’s welcome. The auto press which at the time was a fierce critic of the US auto industry, fell in love with the 1984 Corvette. It was hailed as the first Corvette to be a serious contender against the onslaught of European two-seater sports cars. The 1984 Corvette certainly looked the part. The styling was bar-none the best available at the time. The styling even rivaled some of the best car exterior designs from Italy. The curves and humps of the previous (C3) Corvette were gone. The Corvette was sleek yet mean. It had a low drag coefficient of .34 which was only beat at the time by the Trans Am and the Audi 5000. The sleek aerodynamic styling, a wide stance, and low ground clearance helped make the Corvette’s top speed of around 140 mph feel ultra stable. Though the 1984 Corvette’s styling was a big leap from the previous generation, it still had the “Corvette” styling queues. The 1984 Corvette looked like a modern version of the 3rd generation Corvette with the bumps and humps gone. The familiar four round tail lamps were present but had a more modern look. The heartbeat of the 1984 Corvette was the carryover motor from the 1982 Corvette – the L83 350 CID (5.7 liter) Cross-Fire Injection V8 which packed an extra 5 horsepower from 1982 for a total horsepower output of 205 (torque was also up 7 lbs/ft to 290 lbs/ft.). The increase in horsepower can be attributed to the 1984 Corvette’s free-flow dual exhaust system. The Cross-Fire system was a fuel injection system that utilized dual TBIs (Throttle Body Injectors), each on opposing ends of the aluminum intake manifold. This design had its root in the famous Chevrolet racing motor – the Cross-Ram (small block) 302 CID V8. The problem with the re-implementation of this design was it was setup for both performance and efficiency. The Cross-Fire 350 did provide good power but it was still setup to meet strict emissions and C.A.F.E. (Corporate Average Fuel Economy) standards so its Cross-Ram style aluminum intake unfortunately did not flow like the old racing Cross-Ram intake. It flowed pretty well by 1984 standards but by today’s standards the intake seems as restrictive as a schoolmarm. Chevrolet could have improved performance on the Cross-Fire system by replacing the intake manifold with a free-flow intake which would have made the engine perform similar if not slightly better than the later introduced TPI (Tuned Port Injected) 350 (5.7 liter) V8 which was the main powerplant for the 1985 to 1992 Corvette. The aftermarket X-Ram Cross-Fire intake by Performance Plus Systems (now defunct) proved this to be the case. They tested a stock Cross-Fire powered 1984 Corvette and obtained a 1/4 mile of 15.6 seconds at 86 mph. Then they replaced the stock Cross-Fire intake (475 CFM max.) with their free-flow X-ram Cross-Fire intake (a little over 1440 CFM max.) improving the 1/4 mile time of their test Corvette to 14.3 seconds at 97 mph. This of course proved the performance potential of the Cross-Fire system with a free-flow intake manifold, however this TBI system (like all TBI system in general) was not as efficient in fuel metering as the TPI system that replaced it. And when every little bit counts, this was the real reason why TBI had a short life in production cars. By the mid-1990s the more sophisticated computer controlled fuel injection systems with fuel rails became the only game in town in all cars. TBI was computer controlled however it delivered the fuel in the same manner as a carburetor whereas the fuel rail type fuel injection systems delivered fuel via individual fuel injectors for each cylinder providing more efficiency through more precise fuel metering. With all this being said the Cross-Fire system still gave the Corvette good performance, enough that it could not be accused of being a slouch. In fact the Corvette still managed to easily be the fastest production America car for 1983-1984. The system has also proven to be reliable with many 1982 and 1984 Cross-Fire Corvettes still on the road. Though the L83 Cross-Fire 350 V8 was a carryover from 1982, it had a new modern looking air filter assembly. Gone was the 1982 Corvette’s giant oval air filter assembly cover (which covered the twin air filters – one for each TBI unit). The new air filter assembly was a square assembly with dual solenoid driven flaps (one on each side of the assembly) that opened up (to allow cold air into the dual TBIs) as full throttle position was neared. The cold air was sucked in from around the windshield wipers and traveled via ducts inside the hood to the air filter assembly flaps. Any 1984 Corvette owner can tell you how beautiful the sound is of fresh air sucking through the opened flaps at wide-open throttle. The new air filter assembly was quite the show piece especially since the Corvette now had a new “clam shell opening” hood. The entire hood flipped up towards the front of the car and even exposed the top of the front tires when opened. It was a modern version of the classic Jaguar XKE hood. Helping to get power to the pavement for the 1984 Corvette was a standard 700R4 four-speed automatic transmission (with overdrive) and a mid-year optional Doug Nash 4+3 manual transmission. The 4+3 was an interesting addition, it had four-speed manual architecture with an overdrive gear in every gear but 1st – essentially giving it seven forward gears. The 4+3 was Chevy’s way of ensuring the Corvette made the C.A.F.E. standards so it would not be hit with the EPA’s gas guzzler tax. Where the 1984 Corvette really shined was in the handling department. On the skidpad only a race car at the time could beat the new Corvette. The front suspension was a racing double wishbone design and the rear was a fully independent five link design. And with big 16” wheels and Goodyear’s brand new uni-directional P255-50VR-16 low-profile tires this car was made to corner. The 1984 Corvette could with ease hit .85 g on the skidpad which at the time made it one of the best handling production cars in the world. If this was not good enough for a potential buyer, Chevrolet also offered the Z51 handling package which employed stiffer shocks and springs among a few other upgrades, putting the Corvette in .90 g. skidpad territory. However the improvement from the Z51 package came at a price, driving a Z51 on rough potholed roads almost knocked your teeth out, the suspension was so stiff. 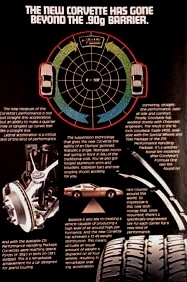 The standard Corvette suspension was much better suited for normal day-to-day driving than the Z51. Chevrolet did learn its lesson, after receiving many complaints for the harsh Z51 suspension, and year-by-year in the 1980s it gradually softened the Z51 suspension to make it more “pothole friendly”, without sacrificing the Z51’s great handling numbers. And what good was a fast great handling car if it did not stop quickly? The Corvette with its large four wheel disk brakes with aluminum calipers, stopping was quick and very controllable. For 1984, the removable T-top roof panels were gone. In its place was a large removable roof panel that opened the roof to fresh air (sans the T-top bar). The design was similar to Porsche’s removable targa roof and was standard on all 1984 Corvettes and could be ordered in either body color or smoked transparent glass. The roof when removed could be stored in a designated area accessible by opening the rear hatch. Nowhere were the changes greater over the previous Corvette than in the interior. The difference between the interiors of a 1982 and 1984 Corvette was like night and day. The 1984 Corvette was state-of-the-art with modern styling queues throughout the interior. The dash layout was a full digital setup; all gauges were 100% digital. Upon first look, most observers were awe struck by the futuristic digital displays of all the gauges. It was almost information overload but it was well received in the era of the digital watch. Fast forward to today and you will see how Chevrolet has backpedaled some; the current Corvette’s display is a happy medium of traditional gauges and digital displays. This is probably the best of both worlds. The interior of the 1984 Corvette was comfy; both the cloth and leather seats provided excellent comfort along with good lumbar support. However to get into the two front seats required some work especially for bigger and older drivers. The driver and passenger had to maneuver over large side rails to get into their seats. The rails were there to provide structural support, and there was one on each side of the car. The 1984 Corvette was a wakeup call to Europe, it showed that America meant business. “America’s Sports Car” was now gunning for the title of the “World’s Sports Car”. Different auto magazine test comparisons of the day that had the Corvette competing against the Lotus Espirit, Porsche 911, etc. showed just how dangerous the new Corvette was to their sports car hegemony. And things improved for the new Corvette, Cross-Fire Injection was put out to pasture for 1985 and a new 230 horsepower TPI (Tuned Port Injection) 350 V8 was released. A few short years later a potent 375 horsepower limited production ZR1 Corvette was released. Today the base 2010 Corvette and the 2010 ZR1 Corvette produce a mighty 436 and 620 horsepower respectfully. Back in 1983 when the 1984 Corvette was released who would have thought this possible? In retrospect the 1984 Corvette was when Chevrolet decided to sober up and compete with the big boys across the Atlantic. In essence the 1984 Corvette was when the Corvette was reborn to a new high-performance life that it still enjoys to this day.